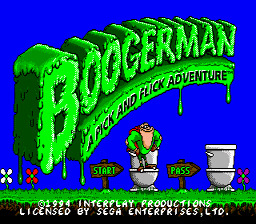 Boogerman A Pick and Flick Adventure 1995 By: Interplay Productions, Inc. Play Boogerman A Pick and Flick Adventure Now! While the credits are displayed after you defeat Booger Meiser, you can do what ever you want, such as fly, fart, burp, and even change back into the millionaire. You can vacuum by pressing "UP" or "DOWN". You can also dust by pressing "A".